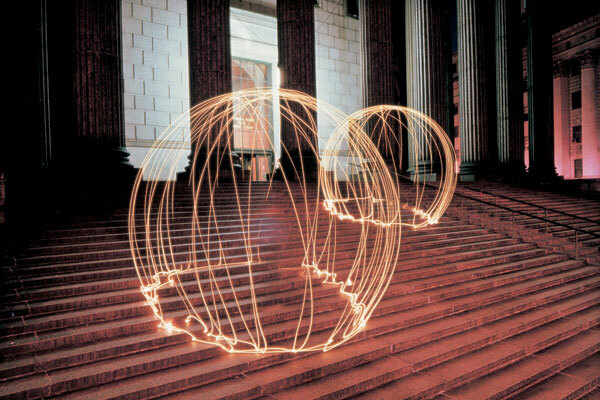 Light artist Eric Staller could be called the father of light drawing or light graffiti in its present day form. 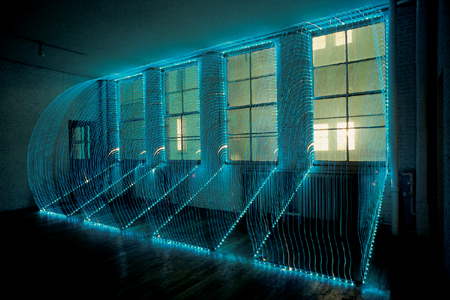 Staller was born in 1947 in New York. He studied architecture at the University of Michigan and graduated with a bachelors degree in 1971. Towards the end of his time at UOM Eric started to create sculpture and pieces of performance art. 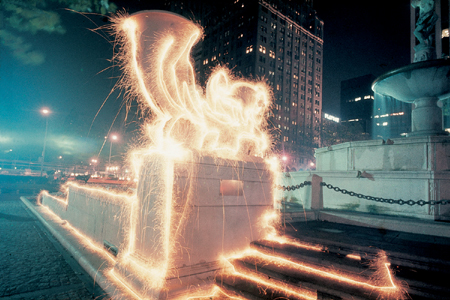 From 1976 to 1980 Staller roamed the dark streets of New York City creating light painting photographs. 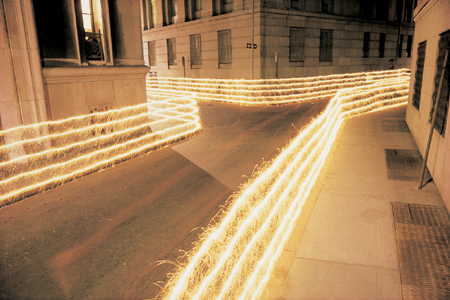 Eric’s Light Drawing series could be the very first Light Art Performance Photographs ever created. It could be argued that Man Ray’s “Space Writing” series were the first light art performance pieces but there is no doubt that Staller’s images such as Light Tubes, Happy Street, and Technicolor Torsos all envoke elements of performance art. 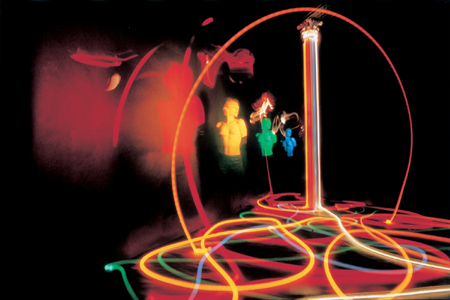 In the late 1970’s staller set up his camera, open the shutter, and moved throughout the frame creating some amazing light painting photographs. 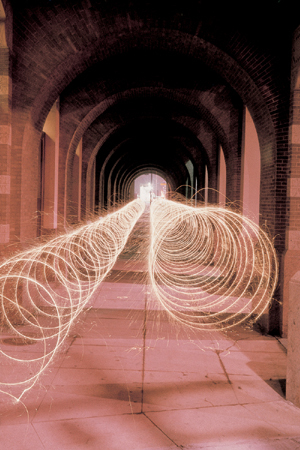 Eric’s Light Drawings series is one of the most influential series on light painters today. Please visit Eric’s website at www.ericstaller.com. LPP ∇ It is wonderful to get the chance to pick your brain a bit to see what you were thinking when you created some of your first light drawing images that have inspired a countless number of light painting photographers! ES ∇ ‘Walker Street’ was the first image that I printed. It was a 1-minute ‘sparkler drawing’ I did in front of my loft in lower Manhattan. 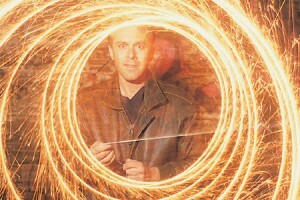 Each sparkler lasted about a minute, so that was the amount of time I had to make the drawing. 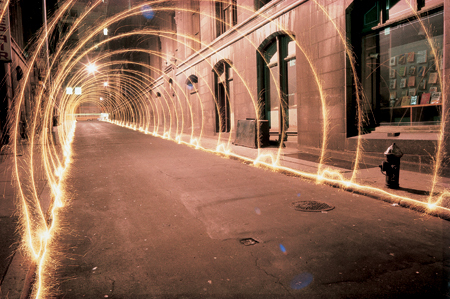 I would lock the camera shutter open, light the sparkler and quickly walk down the street, holding the sparkler at curb level, to complete the composition before the sparkler went out. I felt a strong sense of exhilaration, like running the 100-meter dash with a flaming torch! Getting the film back from the lab was even more exhilarating: it was magic, my presence was invisible! There was just this trail of liquid fire. Suddenly I was drunk with the possibilities. I proceeded to outline everything for my photos: cars, trucks, streets, and monuments. 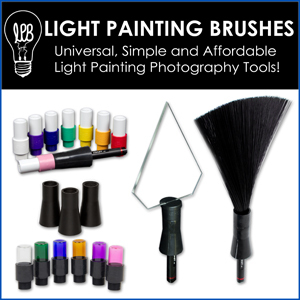 LPP ∇ What inspired you to create some of your first light drawings? ES ∇ I had been doing slide shows, timer –activated installations of slide projections onto gallery walls, or screens suspending in space. They were moving paintings, musically inspired and consisted of a few hundred images that were seen dissolving into one another on the screen. This was many years before computerized multi-media and I remember how disturbing it was when my NY gallery called me to say that one of my slide projectors had jammed! I resolved to compact my choreography into still images, that I printed 30” x 40”. These have since been exhibited worldwide, although at the time most people didn’t know what to make of them. LPP ∇ Funny you say that, presently when a light painter shows their work people usually think that the image is has been digitally altered. You had exhibited your light painting work worldwide but people at the time didn’t know what to think of it, can you expand on that a little bit. What were some of the reactions then and how do people react differently to it now? ES ∇ I was represented by an art gallery in NY and when I did this series I thought I would be better represented by a photography gallery. Directors of photo galleries didn’t think what I was doing was photography!! It was thought to be a gimmick, a trick. Now (smart) people know I was ahead of my time! Digital is way easier! For each of my photographic ideas I would be on location most of a night, and shoot a roll of 36 exposures. To get one winner, or no winner at all. I had to get the roll processed to see if one of these ‘takes’ measured up to what I saw in my mind’s eye. LPP ∇ Was there a moment when it all clicked or was this series more of a work of trial and error? ES ∇ I have had many ‘inspired accidents’ in my career but mostly I have a scientific approach to taking my work intellectually further with each artwork. 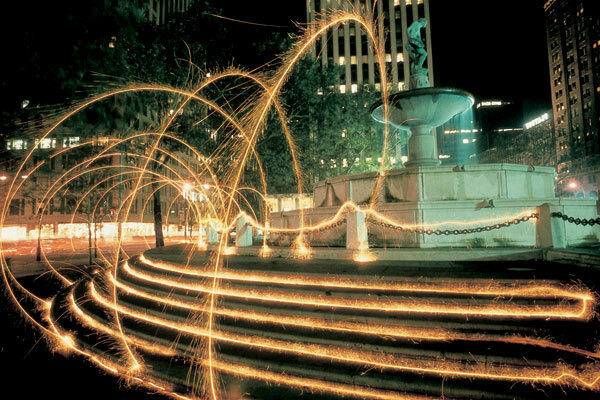 LPP ∇ What is your favorite light drawing you have ever created? ES ∇ My next artwork is my favorite! LPP ∇ Did you work alone or was someone there helping you to create some of your images? ES ∇ I started working alone but hired an assistant once I received my first grant. Having an assistant enabled me to take longer and more elaborate shots. 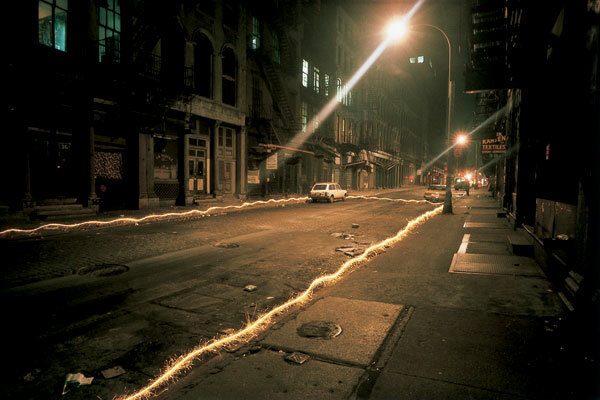 LPP ∇ I know that you must have had some interesting encounters roaming the dark streets of New York in the middle of the night with sparklers and camera gear, is there anything you would like to share? Any interesting stories that happened on one of your light drawing shoots? ES ∇ The city at night was an enchanting place for me. The plazas, bridges, parks and monuments, empty and eerily quiet at night, were dramatic stage sets waiting to be transformed. My dreams in 1977 were taking the forms of fantasy architectures of light. I invented choreographies and volumes of light. I remember being impressed by the architectural uses of the human figure in Fritz Lang’s film ‘Metropolis’ and old Busby Berkeley films, and I began to think of the geometry of my body. By then I found that a 10-minute sparkler was available on special order. I attached one to the end of a broomstick and, using my arm as a compass, scribed arcs overhead as I walked up the middle of the street (Lightunnel). 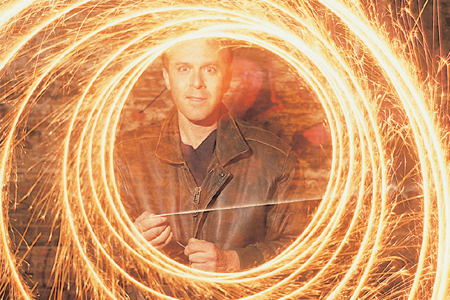 I mounted 5 sparklers on a broomstick and held it vertically, at arm’s length for the 5-minute exposure Ribbon on Hanover Street. LPP ∇ Prior to creating your own images had you ever seen any of Man Ray’s, Gjon Mili’s, or any other light drawing work, if so what did you think of this work? ES ∇ I had known of the Picasso/Mili drawings. LPP ∇ You call your work “Light Drawings” but you also talk about the performances. 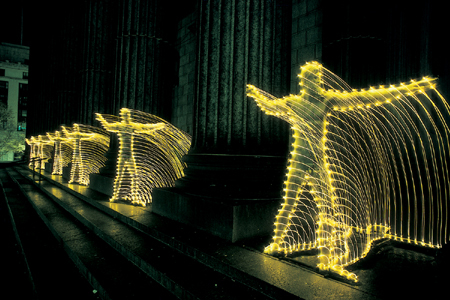 Are you familiar with the current “Light Art Performance Photography” and if so do you feel some of your early work should fall into this category or something different? ES ∇ What I was doing was certainly performances with various light sources but it was the image, the end result that I was interested in. I’m not very interested in being categorized. LPP ∇ You have shifted focus a bit from your light drawing work, do you still create in this medium or were you completed in 1980? ES ∇ I have shifted more than a bit! I evolved from the photography into computerized light sculpture. 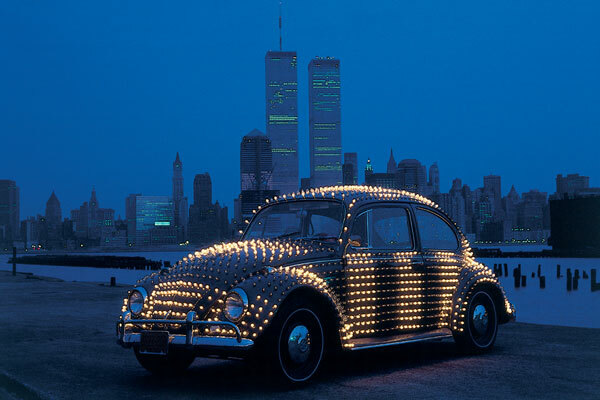 My Lightmobile in 1985 was perhaps my most profound personal breakthrough, and the beginning of my ‘urban UFO’ series. 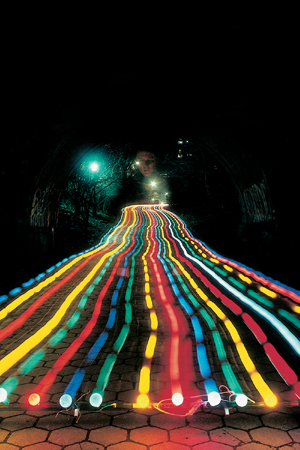 LPP ∇ What do you think of the present state of light painting photography? ES ∇ It is amazing that it has become this movement, and there is a lot of great energy out there. There are some beautiful images being done, but most of the work has a generic-ness to it. I don’t see that anyone has taken it further than what I did more than 30 years ago. 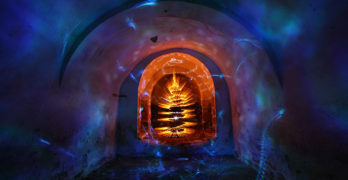 LPP ∇ Are there any light painting artists that you follow or that ARE impressing you with the work they are producing? ES ∇ Of all the artists on your site my favorite is LAPP-PRO. LPP ∇ Do you think light painting has further to go? As one of the light drawing founders what do you think is the next step, or how would you as like to see it evolve? ES ∇ The art form will certainly continue to evolve, just as more traditional art forms have continued to evolve. As with painting and sculpture, with their long traditions, the real innovations are few and far between. In fact, the easier it is to master a technique, the easier it is to fall into a mannerist sameness that most light painting/drawing falls into. Invention, originality, daring, that’s what I look for in art, and I rarely see it. The artist Christo is one artist that really interests me. 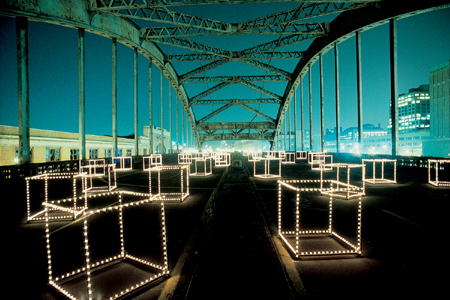 LPP ∇ Do you have any desire to revisit another light drawing series? ES ∇ I felt that I took it as far as I could and that I was becoming too good at it! The surprise was going out of it and I moved on before I started to repeat myself. I don’t want to ever say never, but I am VERY doubtful that I will go back there. LPP ∇ Thank you for taking the time to answers some questions it has been great to talking to you. ES ∇ You can thank me by ordering my book OUT OF MY MIND at outofmymind.com! There you will find 30 images beautifully reproduced, of these photos, that I did between 1976-80.